A change of seasons on the peninsula marks another end to a busy summer with seasonal residents and visitors packed and transported back to their hectic lives and kids tucked back in school. A general settling in for autumn and winter is underway. Lobstermen are pulling or moving traps, the village has slowed to a more relaxed pace. The line at the Village Ice Cream shop has disappeared. As the squeaky red door bangs shut behind you deciding between Ginger or Blueberry Heaven, Strawberry Cheesecake or Espresso Fudge is not so rushed. As you linger on the tiny painted stool and chat with the friendly gal that just gave you the sample to taste, she dips you an extra scoop after you decide on a flavor, even though you only asked for a single. Days at Bittersweet start with feeding and milking and then the girls and I take a walk. I open the back fences and we wander through the path that takes me to my secret place, tucked in the woods. It’s an old path that was used to excavate granite years ago. Along the way my long legged charges nibble on the high and low bush blueberries, gnawing greedily on pine branches to take in all the rich minerals that keep them healthy and strong. Sea Princess’s bright eyes seem to get bigger and bigger as she enjoys this time together with her herd mates. Maeve, Colleen, Mairead and Sweet Pea munch their way with us, enjoying shoots of goldenrod in full yellow bloom. In Ireland, the sheep eat a plant called gorse. It’s a shrub that blooms early in spring with a soft yellow color that deepens as the summer goes on. It’s also covered in thorns but somehow they ignore the rugged prickles and drink in the plant. An old farmer told me once gorse is what makes sheep’s wool soft. It was the same farmer who told me to count the black sheep in the pastures. He said you can tell how rich a farmer is in wool by the number of black sheep. For every hundred white ones, there’ll be one black. I had one black sheep in my flock, she’s now joined by a young black ram but I’m still 95 sheep away from being rich in wool. It takes time to build flocks and herds. A visitor came by the farm stand last week. I just happened to be loading up for a Grange Hall Fair, packing in my lavender bunches, goats milk soaps, jars of heirloom cucumber pickles, wool. He paid me the highest compliment I can imagine. He went in to the farm stand to buy soap for his Mother whom he was visiting. We talked about where he was from, I told him about the Grange Hall Fair tomorrow and invited him to come. As we stood outside the stand, he glanced out over the pasture where my Royal Palm Tom, a mixture of hens, Colleen and Maeve were all grazing. Then he said “it’s obvious you enjoy what you’re doing, you can feel the love here”. I tried not to let tears spring to my eyes. Just this morning, after I’d finished cleaning stalls, filling them with fresh shavings which the girls immediately started dancing around in, clean sheets I like to call it, all four of my Ewes came to the door to look in and see what all the fun was about. I decided to take a flake of hay out and put it in their rack, a mid morning treat. I smile each time I do this for them because they dance right along with me, bumping me along the way, sometimes half leaping in the air and doing a half twist before they land back down. There is a connection between us, maybe it’s just that I’m the hand that feeds them but on days when I’m inside and I look out and catch one of them looking at the kitchen window, the one where they know they can see me best, I have to think it’s more than just that. I’ve added a ram to the flock. He’s a wonderful, sweet boy born last spring. As my fellow farmer and I brought him up from his pasture to load him in the back of my Volvo, Brian gently guided him along, stopping when the boy I call Little Man paused as he was unsure of being away from the flock. Brian said “this is all new to him, I’ll let him take his time.” This over 6 foot man bent down and gently nuzzled the little boys cheek, planted a kiss on his head and waited. Slowly, my new charge started moving again. When we reached the car, Brian gently wrapped his long arms around him, planted another kiss on his head and gently placed him in the back of the wagon. I’ve seen lots of farms and met lots of farmers. There are a few who stand out. I don’t know how the ram felt but I know it was important to this man to in these moments to treat this scared 6 month old boy as if he were the only sheep in the world. We continue the nuzzling of cheeks and kisses on the head each morning just as a reminder he’s come home. Farming is an occupation that speaks to the heart. Whether you’re growing crops or tending beasts, it keeps you close to what’s important, treating all living things well. My heart glows even while my muscles ache, my back feels like it’s broken and some days I’m so tired, supper is made up of a bowl of ice cream or popcorn. The aches and pains seem to diminish when I’m strolling through the woods or sitting in the barn with the animals who’ve come to trust me to tend them with loving kindness. That kindness is returned to me each day in the form of gentle nuzzles, nose to nose kisses and longing glances directed at my kitchen window. I think I know how my LIttle Man feels. Those exchanges remind me I’ve come home. I describe myself as an accidental farmer with a purpose. 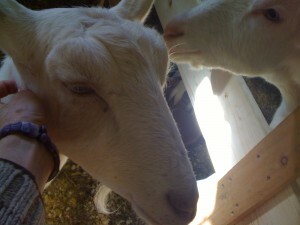 My farm, located on the St. George peninsula of Maine is a certiﬁed Maine State Dairy. I offer cheeses made with milk from my registered Saanen goat herd, a seasonal farm stand full of wool from my Romney cross ﬂock, goats milk soaps, lavender, woolens and whatever else strikes my fancy. Bittersweet Heritage Farm is an extension of my belief that we should all gain a better understanding of our food source, our connection to where we live and to the animals with whom we share the earth.